Camping on Ramshead Range this cold and cloudless night was an opportunity I had long waited for to capture the Milky Way's glory. In this image I have frozen the stars in their position, and then used multiple exposures to capture and track their circular progress around the South cellestial pole at short intervals. Additionally you peer up into the stratosphere and it feels like you are close to entering space. 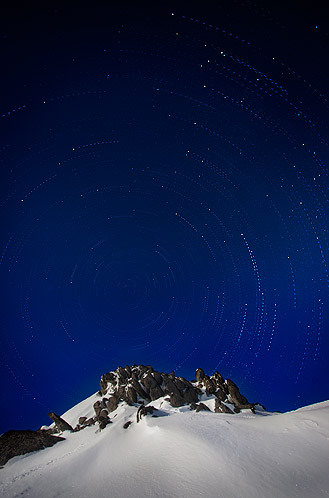 This technique combines multiple points in time to compress time and starlight into an image which is not viewable to the naked eye.